For a gentle cleansing: ALVERDE Baby Sensitive Wash Lotion and Shampoo washes your baby’s hair and sensitive skin without irritating them. 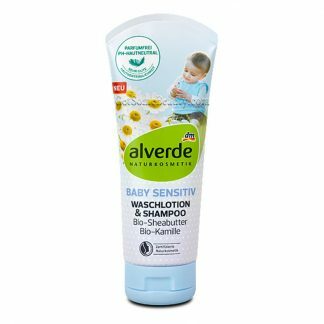 The perfume-free and easily spreadable formulation with chamomile flower extract and shea butter from certified organic farming gives your baby a particularly soft skin feel. The pH skin-neutral formula is gentle on the scalp and makes the hair supple and thus easy to comb. Application: Spread a small amount on the damp hair and/or the damp skin and gently massage with the fingertips. Then carefully rinse.